I am more than a little curious about this independent film “Captive,” which according to last night’s edition of TV Patrol was premiered in Metro Manila. 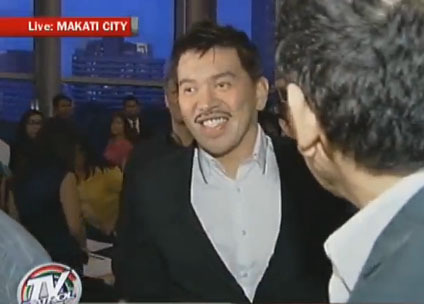 The film is directed by Brillante Mendoza, whose film Kinatay (Butchered) made it to the Cannes Film Festival in 2009. I cannot say that I know an awful lot about Mendoza; but I understand from some articles that I have read that Kinatay drew rave reviews in Cannes. Captive, from all indications, does not have the shocking rawness of Kinatay but is instead told as a chronicle of the actual events that the inspired the movie’s story. I have not yet seen the movie, which topbills the French-born actress Isabelle Huppert. Among the other notable names in the cast are veteral actor Joel Torre, indie film favourite Sid Lucero, Mercedes Cabral of the recent soap opera Hiyas and the erstwhile controversial but now apparently reformed Baron Geisler. The movie chronicles the plight of local and foreign tourists plucked from their luxurious cottages at the Dos Palmas resort in Palawan by members of the renegade group Abu Sayyaf, said to have active links with the terror group Al Qaeda. My personal interest in the incident – as well as in the movie – stems from the fact that among the hostages taken from Dos Palmas was a long-serving member of the Board of Trustees of the school where I used to work and his wife. The incident, which occurred in May of 2001, made headlines worldwide because at least five of the original twenty or so hostages were killed by the renegades, including a couple of American citizens. The hostages were roused early one morning by the heavily armed renegades and whisked away in rubber boats to Abu Sayyaf strongholds in Mindanao. The Dos Palmas incident was just one of several daring raids conducted by the group, purportedly to extract ransom from the families of hostages. The hostage-taking incident was an embarrassment to the Philippine government; and large-scale operations involving the Armed Forces were undertaken in an effort to track the renegades and free the hostages. The children of this BOT member went to the school; although some of them subsequently moved to another school also run by the De La Salle Christian Brothers. To respect his privacy, we shall keep his name out of this article. However, who he is and that he was part of the abducted group was common knowledge in the school at the time. In fact, after his release, Brother Rafael Donato – the President of the school at the time and his personal friend – arranged for a Thanksgiving Mass to be celebrated. This BOT member was asked to speak after the Mass; and although I cannot now recall his exact words, what I do recall is that he mentioned that he harboured no grudges against his abductors and that the experience was ultimately life-changing. Back to the movie, I understand from the news that it has received some criticism from the media because it portrays a rather negative image of the country to the world, particularly these days when there are efforts to promote the country for tourism purposes. Mendoza defended the movie’s theme by saying that movies are not made just to chronicle events of the past but also because film-makers are obligated to show their love for the country. The interview with Mendoza was abruptly cropped so I do not fully understand the context of his defence. I guess I will have to see the movie to see what he meant; and that will probably be money well-spent because although the film failed to make it to Cannes this year, it was shown during the recent Berlin Film Festival.